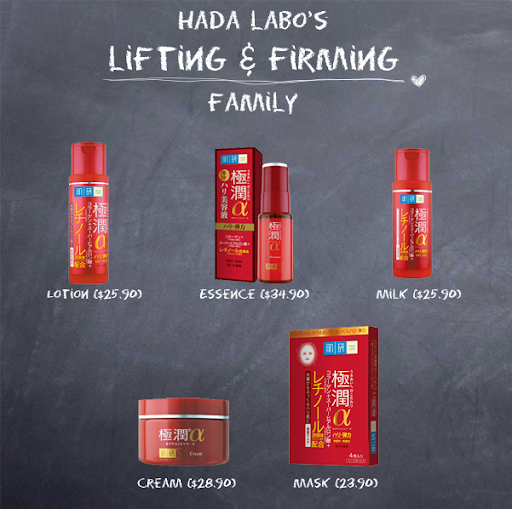 May marked the introduction of Hada Labo's latest Lifting and Firming Range. This range contains 3 key premium and potent ingredients; Vitamin A Retinol, Hydrolyzed Collagen and the brand's signature Super Hyaluronic Acid (SHA) to 'restore youthful bounciness'. I was sent the Retinol Lifting and Firming Lotion for review by The Sample Store. Retinol Vitamin A: To reduce fine lines and wrinkles. Collagen: To improve skin elasticity for firmer and more lift in the skin. Super Hyaluronic Acid: To instantly lock in moisture for intense hydration. All these ingredients serve to even the skin texture and make it go 'bo-ing bo-ing'! The lotion is also free of fragrances, mineral oils and colourants and has a balanced pH. I have seen Hada Labo products on my many trips to Watsons but have yet to try their products. My cousin loves the Super Hyaluronic Acid Hydrating Lotion so I was really keen on this product. Besides, toners aren't exactly part of my skincare regime. Heh. The lotion is poured out from its bottle. It is easy to control the amount of lotion dispensed as the lotion's pretty thick and comes out slowly (I think the word's 'viscous'. Ex-Geography student here. Haha! Ah. I do miss Physical Geography!). As long as I don't have to stick my fingers in the product, I'm fine with the packaging. (: You do have to clean the sides though as a trail of the lotion is left around the opening if you aren't careful. The lotion comes out pale yellow and a little gooey. And umm... I'm not sure if it's just me, but the lotion smells a little like SKII's Facial Treatment Essence. Does anyone else think so? The lotion's thicker than I expect for a toner so I actually skip my moisturizer after applying this, as I don't like having thick layers sitting on my skin. So I am using this as a toner/ moisturizer. After washing my face with Cetaphil, I pour a pea-sized amount of this lotion and pat it into my skin. As the lotion is thick, it takes a much longer time to be absorbed into the skin than most toners/ moisturizers. The lotion leaves my skin feeling a tad sticky. It's a little uncomfortable for particular me and the weather at night is almost as hot as in the day... Okay, that's exaggeration but it does get a little uncomfy. But but it's pretty alright since I fall asleep after application (I do my skincare regime right before bed and not after my bath.). Besides the lotion, Hada Labo has a whole host of other products under this range! I'm interested in the milk because well, 'milk' always sounds so luxurious! Like Cleopatra, no?